A useful article on everything you need to know about Getting Over It with Bennet Foddy! First off, I'd like to tell you that you came to the right place. Starting out in new games is always terrifying; even I sometimes pee myself in excitement. Hopefully, this guide will serve its purpose and save yourself a clean up of your chair. 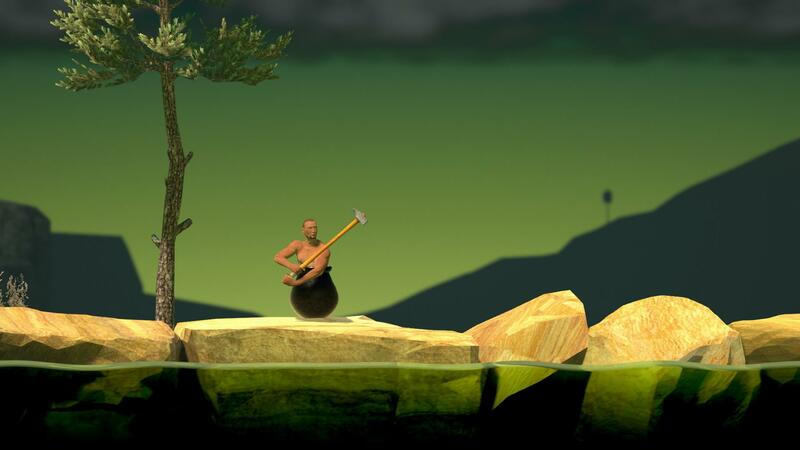 The objective of the game is to get a man in a cauldron up a mountain with a hammer. Doesn't sound that hard, you say? See for yourself! But of course, before you go rushing into the game like an absolute madman, keep reading this guide. You are playing as Hans Bohr, a 28-year old Danish carpenter. He moved to Belgium after he had his second child with his wife Alma, for a change of scenery. In the year 2001, he gets a job as a carpenter for the ENDECO Carpentry Company. After working for there for 3 years, he decides to apply for the manager position after his manager was let go after having trouble with the law (what he had done was not specified). His manager, a surly man by the name of Louis Peeters, believed that Hans had somehow set him and derailed his entire career that he had worked so hard for. One fateful stormy night, which the narrator refers to as "The Incident", Louis apprehends Hans on his walk home from work. Louis begins shouting at Hans from his car, and Hans, spooked, starts running, tools in hand. WARNING: to those that are easibly disturbed, maybe this part is not for you. Louis drives up to him at a dangerous speed, and drives over his foot. Hans falls over, holding his foot in pain. Louis gets out of the car, and opens his trunk. He pulls out a large, rusty Cauldron, and begins walking towards Hans. "Please.. no.." Louis picked up Hans and put him into the Cauldron, feet first. He drags it to the side of the nearby pier, and without a second thought, throws him into the sea. Louis laughed, and picked up Hans' trusty hammer. "This is for costing me my job." He then threw the hammer at Hans as hard as he could. It missed by an inch, and began sinking to the ocean floor. Hans, thinking quickly, flipped the Cauldron over and barely caught the hammer. The storm began to create towering waves with a mighty force. Hans and the Cauldron were lost at sea. For what seemed like years, Hans drifed in the open ocean. The clothes that he wore were uncomfortable, and he threw them away. Eventually, he woke up after something hit his head. He looked up, to see that he had reached land. Desperate to find help, and to get out of the Cauldron, Hans used the only resources he had to make his way up the mountain that he hoped, on the other side, there would be civlization. The controls are fairly easy to grasp. You do not need a keyboard. All you need to Get Over It is your mouse. Your goal is to reach the summit of this mountain, and the first obstacle you are faced with is a giant dead tree. A maneuver that you must know in order to have a chance at surviving this game is what I like to call the "Pogo Pounce." Simply place the end of the hammer beneath you, and push off the ground. This should generate enough force to launch your self up decent heights. You need to know this for many of the obstacles. Devil's Bottom: the first 'real' obstacle in the game. This is where the Narrator begins talking. Most people spend an average of 20 - 30 minutes at this location before they complete the whole run. In the grand scheme of things, it's not so bad; however you must consider that this stage is where most players aren't familiar with the controls. Devil's Chimney: Definitely one of the hardest stages of the game, entirely because it is so finicky and difficult to figure out. Of the many locations in this game, probably the 2nd hardest, and it hits you fairly quickly in your run as well. The trick is to mount the small rock, reach your hammer as high as you can on the left side, make sure it is in a safe location (preferably above the little stub) and slowly lift yourself. Once you are close to the lantern, quickly move the hammer, and land it on the lantern. All in one motion, also fling yourself to the second one, and finally do one big push and hopefully land on top of the Chimney. If you mess up at the top, you will fall all the way to the beginning, and if you fall in the middle, you will slide down to the slippery metal area. Devil's Orange: This one is a high-stakes, high-reward obstacle. If you take it slowly, you should be fine. If you mess up, you are back at the Carboard Boxes. Devil's Slope: Trial and error. If you mess, up, back to the Swinging Bucket of Hell. Tires your arm out if you stop, and if you stop, you're losing a lot of progress. Hopefully these tips and tricks have helped you!